On a January afternoon when the polar vortex has iced Toronto, Vince Parrell shows up on Skype in a t-shirt and shorts, palm trees reflected in his glasses. The founder, former owner and revered instructor of Vince Parrell’s Dance Centre is all smiles and full of energy as he welcomes me to his winter retreat in Bonita Springs, Florida. The last time I spoke with the dancer, actor, singer and choreographer was in 1987 at the Limelight Dinner Theatre where the 36 year-old had just performed in a 10:30 p.m. show after a full afternoon of teaching dance at his Main Street studio. He and his performer wife, Lea, were expecting their first child. So has he retired? Hardly. He and Lea work and play from their rented two-bedroom Florida coach house from November to May, the Toronto home they have owned for 20 years, and their cottage on Georgian Bay. He is the creative producer of EVENTSOURCE, a division of Harmony Marketing founded by his wife in 2006. The baby they were anticipating in 1987, Victoria Parrell, is the company’s marketing and communications consultant. Their second daughter, Deanna, is getting her real estate license. 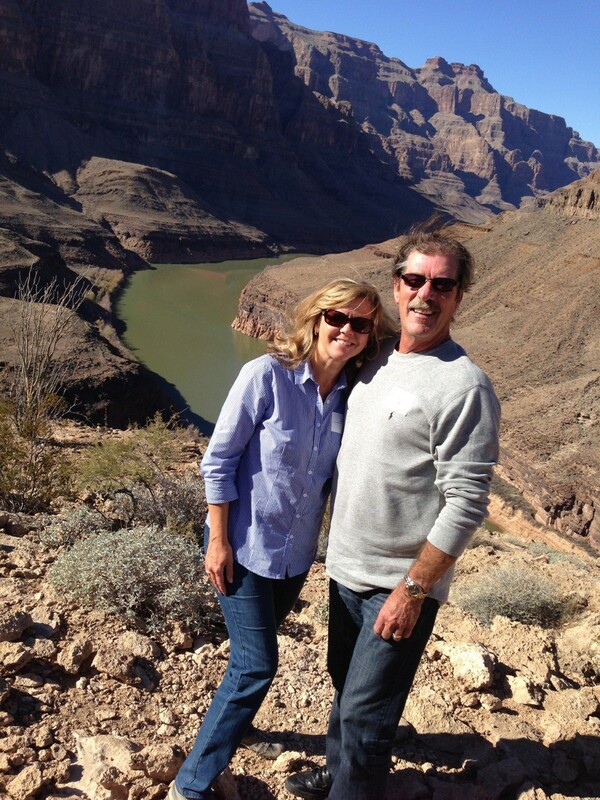 Lea and Vince Parrell on a recent trip to the Grand Canyon. “As long as I’ve got Skype and the Internet, I can work from anywhere,” Parrell says about his primary focus as producer and creative director of the opening and closing ceremonies for Special Olympics Ontario, which he has been doing for 20 years. He teaches tap to seniors at Scarborough Village and down south, where he is also working on proposals to launch Senior Follies at local venues. He is really looking forward to the 2015 Special Olympics in North Bay. Since 1987, he has made a mark on many fronts: Sheridan College, Luminato, and in 1999 he created the first Canadian TV ballroom dancing competition, Dancin’ at The Palais. The full name of Vince Parrell’s Dance Centre had already been shortened to VPDC so when the ownership changed hands, the name became Vital Precision Dance Company to keep the same initials and smooth the transition. He wanted to tip toe out but during his last showcase, he was in for a big surprise. Former students from all over North America contributed YouTube clips that portrayed a retrospective from day one. “There wasn’t a dry eye in the house,” he says. Lorie Murdoch wrote a series of articles under the Persons of Note banner in 1986 and 1987. She decided to follow up with some of her subjects to see where they have ended up, in a new column which will appear occasionally. Greetings Lorie, sounds like Mr Parrell deserves a metal. However life is not that simple. studio manager of over twenty five years? more to this “song and dance” you are following up on V.P.